Chamber Music New Zealand is touring 15 centres around the country with the Turnovsky Jubilee Ensemble in June, and will include two audio described concerts in Auckland and Dunedin. 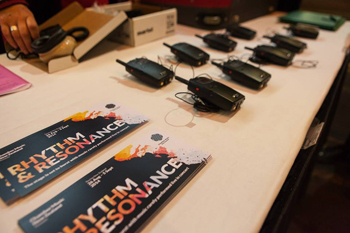 Sue Jane, Education and Outreach Co-ordinator for Chamber Music New Zealand, says the first audio described Rhythm and Resonance concerts last year in Wellington and Auckland were highly successful. "We want to make our music accessible and available to all New Zealanders, which includes relaxed performances, workshops, masterclasses, school outreach and the elderly," she says. The 2015 concert season is celebrating the 50th year of the New Zealand Community Trust Chamber Music Contest for secondary schools. The Turnovsky Jubilee Ensemble is made up of Chamber Music Contest Alumni who are either established chamber musicians or emerging artists who have international careers. The ensemble is led by former concert master of the NZSO, violinist Wilma Smith, and has nine core members. Local musicians will join the group at some of the concert venues. They will perform music by Felix Mendelssohn, Benjamin Britten, J.S. Bach, Wolfgang Amadeus Mozart and New Zealand composer, Douglas Lilburn. Audio described concerts make the event accessible for blind people, by listening to commentary via headphones. A narrator describes what is happening on stage in between the music pieces. "An audio describer might say when the performers walk on stage, where they are standing, what they're wearing and describe little non-verbal asides or jokes," Sue says. At this year’s audio described concerts there will also be a touch tour on stage before the concert. Patrons meet the musicians, hear some of the music and touch instruments to help familiarise themselves with the music before the concert. They will hear the instruments and what they sound like played separately and together. "Another Chamber Music New Zealand initiative is our relaxed performances which began back in 2012 with one of our touring ensembles. These are for people who find it difficult to be in a more formal concert environment. 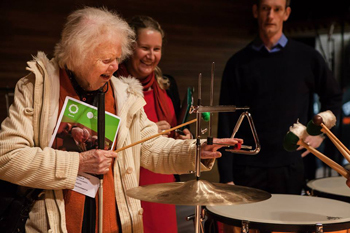 This format enables audience members to get up, move around, make noise, participate which is ideal for those with learning disabilities," Sue says. Julian Raphael, a community musician from Wellington, supported by the Menagerie South Ensemble (Tessa Petersen - violin, John Van Buskirk - piano and Mark Walton - clarinet), staged one such relaxed performance last month. 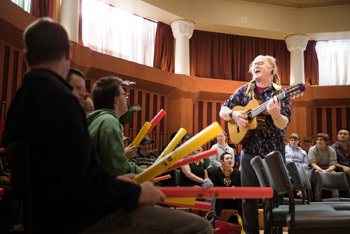 Over the course of the week before the relaxed concert, Julian worked with the residents from the Hohepa community in Christchurch. This learning was then incorporated into the performance with Menagerie South. 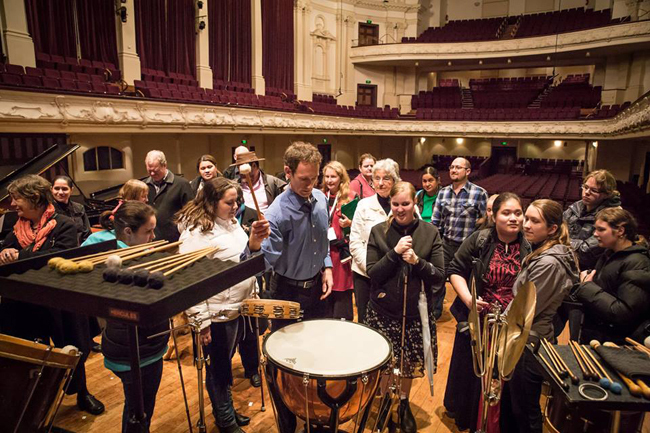 “It was a wonderful experience with Hohepa residents free to clap, move around and interact with the musicians. We also always make sure we provide quiet spaces for participants to help with vision and sound overload," Sue says. In the future Sue would like to see CMNZ incorporating more of the relaxed performances into their normal touring schedule. “Wouldn’t that be great?” says Sue. Original generation time 1.7412 seconds. Cache Loaded in: 0.0388 seconds.